Step 2. Place the milk, cream, sugar and vanilla into the smaller tin. Seal. Step 3. Place the smaller tin into the larger tin and fill with ice to halfway up the side. Sprinkle one cup of rock salt over the ice. Fill ice to the top and pour remaining cup of salt over the top. Tap container firmly on the bench to settle contents and seal with lid. Step 4. Shake well for 20 minutes. You may have to add more ice to the container at the halfway mark. To stop your hands from freezing you can cover the outside of the tin with a tea towel. You can eat this right away or pop it into the freezer for later. You can add flavours to this ice cream like chocolate topping for chocolate ice cream or caramel topping and salt for salted caramel ice cream. Eventually when my arms got tired I placed the tin on a towel, gathered up both long ends and rolled it using the towel. 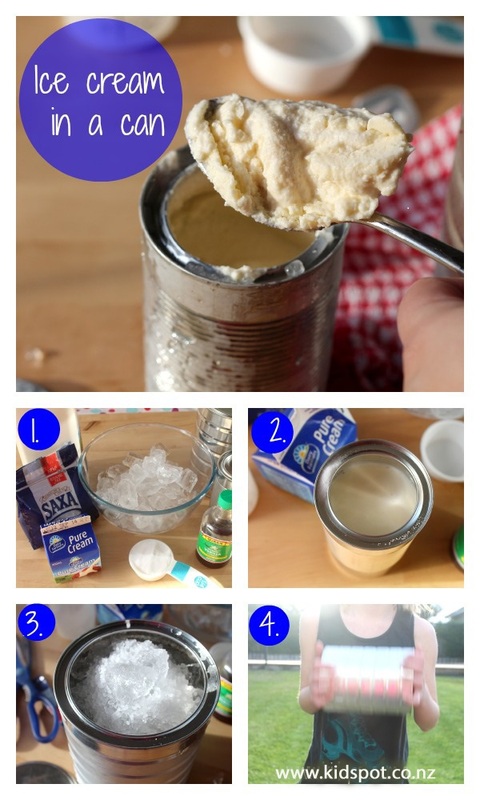 If you like making your own ice cream then this 2 ingredient ice cream is so easy that the kids can make it themselves. Ice cream birthday cake is a great party treat and there will rarely be any leftovers! You can make this Ice cream slice with biscuit and enjoy perfect portions for your guests. If you like to add delicious texture to your ice cream then this Ice cream cookie crunch is just what you need. Grown up palates are a little harder to satisfy and this Ginger ice cream is a little more complex flavour-wise. Ice cream sundaes will take you back to your childhood and this delicious Ice cream sundae is the real thing. If you are looking for a Christmas treat but it's too hot for plum pudding then this Christmas pudding ice cream is ideal. If rocky road is your favourite chocolate then see what happens when we combine it with ice cream in this Rocky road ice cream sundae. Ice cream sandwiches are even better when they are homemade. Pop these in the freezer. If you really want a treat to share with the kids you can make Nutella popsicles – the best part is they also have only two ingredients.